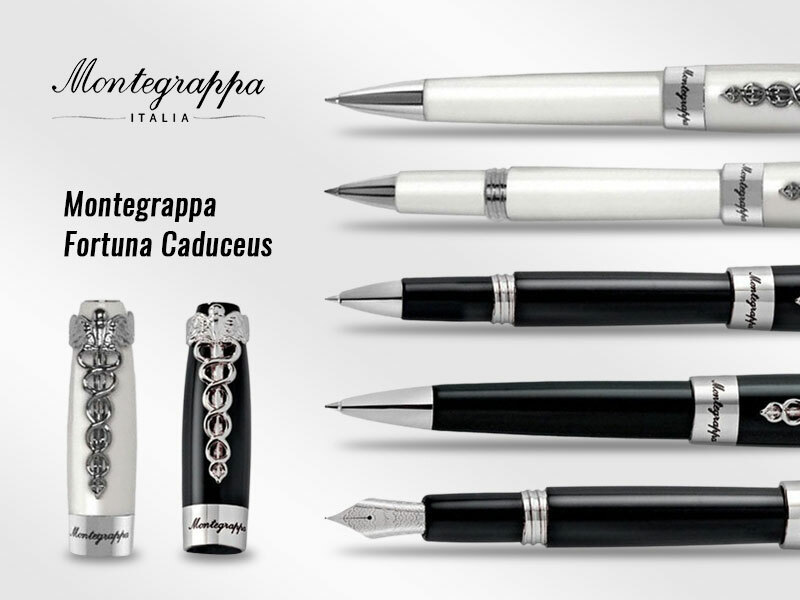 Montegrappa extends its Fortuna series by adding a new range of writing instruments called "Caduceus". The series was introduced earlier this year and has made a robust presence in the market since the date of its inception. The name Caduceus is taken from Greek Mythology. It was the name given to the staff carried by Greek God Hermes. The mystic staff is considered as a symbol of health and purity, and still we can see it outside the gate of many health institutions. Staying true to its name, the pen reflects an impeccable sheen that would impress every pen enthusiast. As other Fortuna writing implements, this fine collection exudes Italian pen making charisma. Caduceus pens are made from same material as other Montegrappa Fortuna writing implements. The body and cap of the pen are crafted from smooth black/white resin which is accompanied by gleaming palladium coated accents. The barrel section has no decorations; instead, it tapers down towards the rare end and displays a simple yet expressive design. The cap is slightly wider than the barrel and features a large band that reads Montegrappa. The evocative design of the pen is embellished by a Montegrappa medallion which is mounted on the top of the cap. The most attractive feature of this fine collection is its clip. The design of the clip resembles with the shape of Caduceus. However, the clip is stiff which might be a downside for many. But, appearance wise the "Caduceus" is a well-groomed collection of writing instruments which will surely capture your attention. Caduceus writing implements are available in three different writing modes: fountain, rollerball, and ballpoint versions. The fountain and rollerball version feature a screw-on cap with minimum threads. The cap comes off within two or three rounds, making the Caduceus a convenient carry on-the-go companion. On the other hand side, the ballpoint pen features a smooth twist-action mechanism which eases the process of extracting and retracting the tip. The fountain pen version features a sturdy stainless steel nib with a filigree pattern etched on the front. The pen fills via cartridge/converter, a large one, which leaves a little doubt about storage capacity. However, depending on the circumstance, do stack up and fill an ample amount of ink every time. On the counter side, the rollerball and ballpoint pens are equipped with a smooth-flowing refill that lay down smooth and clean lines on paper. All Montegrappa Fortuna Caduceus pens have a nice heft which enhances the joy of writing and offers a sense of balance while pressing the tip against the writing surface. The resin grip section is exceptionally comfortable to hold and helps elongate the writing sessions without any fatigues. All Caduceus writing instruments are great and are designed with the quality that we would expect from Montegrappa. If you want to experience fine writing, then the Fortuna Caduceus series might prove to be an ideal companion.